What a goal fest this weekend turned out to be for the Cosmopolitan Soccer League’s 2nd Division! With a total of 40 goals across 16 teams in 8 matches, the table has shaken up in more ways than one. A win for FC Japan, at the expense of Hoboken’s “invincible” run! With FC Japan loathing in last place, they needed to prevent a blowout when Southern leaders Hoboken FC came to town. Turns out a strong and confident winning performance really ISN’T a stretch. Roaring in with a game plan in hand, the Japanese outfit came out 3-1 winners against the New Jerseyans Saturday night, April 21st. This was a convincing performance by Japan, compared to the last match these two had back in December 2017 where Japan were the victims of a 9-0 demolishing by Hoboken. With 4 games left in hand for the season, hopefully this is a sign of coming attractions as they need as many wins as possible to save their season. Staying in Randall’s Island, NY Ukrainians steamrolled past Panathinakos USA 8-1 across the field this past Saturday! Panathinakos has now conceded 15 goals in only 2 matches in the month of April, landing in last place of the Southern Division and looked poised to end this season in low to mid table contention unless they collect nothing but wins until May. With NY Ukrainians, they now have their 3rd win of the season and sees their next games up against the likes of FC Japan and Stal Mielec NY. Ukrainians player Andres Munoz now has become the team’s top scorer with 6 goals and 3 assists in 6 matches and will surely be the danger man against their next matchup against Japan on April 29th at Randall’s Island. 8 goals separated Stal Mielec vs. Williamsburg at Bushwick Inlet Park where the former came out as winners 5-3. Stal Mielec NY have finished their chances indeed. They’re in form going into their Polish Derby against Polonia Gwardia NY and are only 4 points away from top spot. WIFC are newcomers to the Division 2, having won back to back title wins in the Metro Divisions to earn promotion to Div. 2 in 2017 and aren’t letting this win negatively effect their mentality, including their Jack Flamhaft Cup run. “Our focus now is on the Cup. We have a semi-final match coming up against NY Ukrainians, who we recently beat 3-0. It’s our best shot at a trophy this year and we are hopeful we can win the cup for the first time!” Von Rosenburg added. Williamsburg are currently sitting below Stal Mielec in the North Division in 4th, 5 points below them. Polonia Gwardia NY traveled to Queens on Sunday night and left with a clean sheet and 3 more points to their tally! 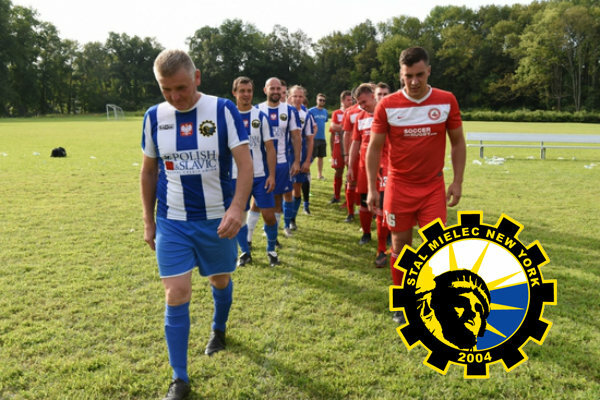 The Polish side dispatched Club Deportivo Iberia 4-0 at the Grover Cleveland Athletic Field in Queens on Sunday night. Gwardia now sit in 2nd in the South and look like staying put, allowing 12 goals in 12 games, the best defence in the entire Div. 2. Club Deportivo, on the other hand, are on back to back defeats after having to forfeit their match against Stal Mielec in mid April and are currently in 5th place in the South. Head Coach Ed Romero told the Cosmo League exactly what his game plan was during the match Sunday morning as he saw it. While Sporting South hasn’t seen their fortunes favor them this season on the field, some of their biggest obstacles might actually be off the field, like many teams in this league. “Organization, recruiting, managers, finding a home field...just to name a few. I’m glad to say that we solved most of these issues, if not all of them. FC Spring Valley got the better of Sporting South Bronx but overall Coach Romero can see the improvement the team has made within these last few matches. “My game plan was to better our defense. I like it now. No more blowout losses. Sporting Soccer Club also aren’t far from hope. The same day saw their Sporting Astoria side down Spring Valley’s reserve side 6-0 in the Reserve Division 2, which gave them something to celebrate. South Bronx are now in 8th place in the Northern Division with 9 points in 12 games and FC Spring Valley are on top with 27 points. A draw, 2 losses, 2 wins in Celtic’s last 5 matches. They’ve been able to score goals on Sunday thanks to dynamic players like Raul Zuniga and Adrian Garcia but haven’t been able to deliver consistent wins. With many of the top teams set to play against each other going into the home stretch late into the season, Kane believe this is the best opportunity to go for wins to climb up the table. “The top four all play each other and they will take points off one another. It's just important we continue winning...hopefully that will be enough to put us in playoff contention.” Kane adds. NYPD FC now has lost 3 matches in a row and sit in 7th in the North with 3 matches left to get them back up the table. KidSuper Samba AC come out victorious in a 9 goal thriller against the Central Park Reds! A 6-3 scoreline saw KidSuper come out as winners against Central Park Rangers Reds on Sunday night. The Reds haven’t been able to reverse the decision this time suffering another 6-3 loss, the same scoreline they loss to KidSuper back in October of last year. KidSuper forward Ebrima Jallow was on fire this time, scoring 5 on the day. With 14 goals and 6 assists in only 10 games for Jallow and fellow goalscorer Alhoussain Bah on 11 goals and 7 assists, the league’s best defenders are finding harder and harder to deal with this dynamic duo. "I would say that they compliment each other well. Alhoussain’s dribbling can be very difficult to deal with, and he is very comfortable with the ball in tight spaces. Ebrima’s sheer pace and athleticism is a handful, especially in the open field." Certainly a dangerous team this season, they have been on the rise this season and look to only improve during the rest of their matches. "We were up 2-0 early but KidSuper came back strong, we had a short roster as it was on a Sunday night and had 3 injuries mid-game to starting players so we unfortunately unraveled." Reds Manager Blake Berg told the Cosmo League. "We had no shortage of opportunities but we couldn't bury them and technically, KidSuper had a few very talented players that were difficult to contain." Central Park Rangers took the loss to the chest and seem set prioritizing good performances going further in the Flamhaft Cup rather than the league. "We look at every game individually and look to win them all. However, a shot at us winning the league looks out of grasp." "Our priority is state cup now." And Brishna and Beyond FC had automatic byes, playing their next match this weekend! Click Here To Check Out Upcoming Matches!